PCS'ing to Hawai’i will either awaken or further stimulate your sense of adventure. With so much natural beauty to explore, you'd be crazy to not take the opportunity to experience the great outdoors. Almost every weekend, I join my friends in snorkeling to new depths, hiking to the top of a new volcanic mountain, bathing at the base of a secret waterfall, seeking out another spot deemed a “local favorite,” or discovering more of the island’s hidden gems. In this post, I'll share the underwater adventures and favorite hikes that have filled my life with the spirit of Aloha. When I first moved to the islands, snorkeling became my primary passion. If you live in Hawai’i, you better don your mask and fins—the sea life here is incredible. There are two places on O’ahu that I would recommend to any traveler: Shark’s Cove and Hanauma Bay. The water’s fine, so jump right in! Shark’s Cove is, hands down, the best spot to snorkel and dive on O’ahu. It’s located just west of the world-famous Pipeline Beach on the North Shore. Despite its name, sharks don’t venture into the cove. This small rocky bay forms part of Pupukea Beach Park and boasts blue water, shallow tide pools, and an impressive amount of sea life in the deeper water. In the winter, the tides shift and create some of the most intense surfing waves in the world. Which, unfortunately, means trips into Shark’s Cove is only a seasonal activity. During the summer (May through September), however, the tides are perfectly suitable for swimming, snorkeling and diving. Diving into the water in Shark’s Cove feels very much like an escape from reality. It can get crowded, but you’ll hardly notice that once you’re in the water. I’ve managed to see hundreds of fish and a few sea turtles every single time I’ve been to Shark’s Cove. It also offers a captivating playground of volcanic rock that features lava tubes and small sea caves through which a skillful diver can swim. There’s nothing else like it on the island, and one dive there simply isn’t enough. Check out my YouTube channel for snorkeling videos! After you’re satisfied with your diving adventure, you’ll surely be hungry for lunch. Just stroll across the street and enjoy a cup of Hawaiian shave ice, a hefty portion of pad thai, or a plate of fresh shrimp from the various food trucks that always occupy that part of the neighborhood. You won’t be disappointed! Hanauma Bay is a large volcanic crater that eventually eroded and filled with ocean water on the southeast side of O’ahu hundreds of years ago. Since then, the shallow reef, calm waters and sandy beach became a favorite spot for tourists. A horseshoe-shaped beach envelopes Hanauma Bay, making it ideal for both beach-dwellers and eager divers. Despite the crowds, snorkeling in Hanauma Bay is something everyone has to experience at least once. The knowledgeable local adventurer can easily explore well beyond the busy areas, escaping the touristy spots and crowded beach. It’s best to get to there before the surge, so I highly recommend arriving early in the morning. Their access gates first open at 6 a.m. Fish and turtles heavily populate this diving area because Hanauma Bay is a protected marine life conservatory. The most alluring parts of this adventure are only accessible after swimming past the shallows and into the deeper parts of the bay, in my opinion. Several fish, pockets of sea life, and steep ocean walls provide a wide variety of sights to behold for the bold snorkeler. I will issue one word of caution if you’re not a strong swimmer: don’t venture very far out! The tidal currents funnel through the center of the bay, which might be difficult to overcome if you doubt your swimming ability. But if you’re no stranger to water, I highly recommend exploring every part of the Hanauma Bay! Once the winter weather sets in, snorkeling and diving becomes too dangerous to enjoy. With the high waves and winter surf, I turn my sights to the mountain peaks, numerous hills, ridges, and volcano cones scattered throughout O’ahu. If you don’t own a pair of comfortable hiking shoes now, you might have trouble on the trails, as tropical rain has a tendency to muddy the paths from time to time. Originally named Kohelepelepe, Koko Head is a large volcanic crater that dominates the skyline on the southeast side of O’ahu. The hike up to its summit is a local favorite for those who also love a morning workout. A set of old railroad tracks creates a stairway to the top of Koko Crater. The trail is a heavily trafficked and sure to make you break a sweat, but the view at the top is worth the effort. The steep climb eventually offers sweeping panoramic views of Sandy Beach, Hanauma Bay, Hawaii Kai, and (in the distance on a clear day) the neighboring islands of Moloka’i and Maui. At the top of the trail is plenty of space to spread out and relax, including an old metal grated platform and a WWII-era concrete pillbox. All you need is a pair of running or hiking shoes! Right and Up tip: Do this hike before dawn and bring a flashlight to watch your step along the railroad ties. Viewing sunrise from the top of the crater is an unrivaled experience! 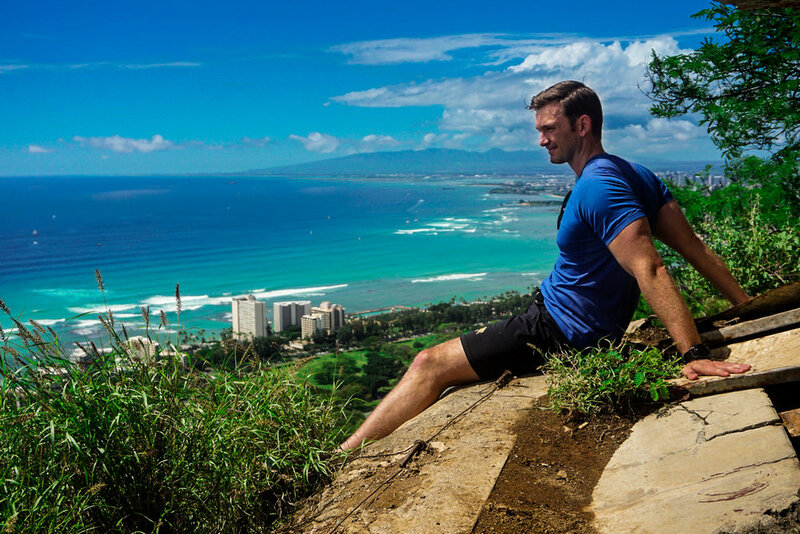 Located near Waimanalo, this hike boasts the most underrated view on O’ahu. It's hard to beat the stunning ocean colors you’ll see along this trail. The trail is lightly trafficked and accessible through an “off-limits” area just across the street from the Makapu’u Lighthouse parking lot. The trail head won’t be immediately apparent, but if you bypass the signs and climb up the first ridge, you’ll pick up the trail quickly. The Makapu’u Tom-Tom trail is located on a drier part of the island, so you’ll pass through some tall grass and succulents not normally seen in other parts of the island. The trail has several ascents and descents along the ridgeline, so come prepared to climb! The best feature of this hike is a puka, characterized by a hole in the rock wall along the trail that provides you with an opportunity to peer through this “window” and overlook the beaches down below the steep cliff face (see cover photo). The trail continues for another 4 miles past this puka, but I recommend using this as a turnaround point unless you want to spend several hours on the mountain. Right and Up tip: In the springtime, bring a set of binoculars and you’ll probably be able to see some whales breaching near Rabbit Island and out past the Makapu’u Lighthouse. Prepare yourself for a climb! This gorgeous hike through the rainforest has you scale the side of the Ko’olau Mountain Range, which bisects the windward and leeward sides of O’ahu. At the top of the trail is Ka’au Crater, which is filled with a swampy marsh and protected by volcanic walls at the summit of the mountain. The marsh fills with water from the perpetual rainfall in this microclimate, which permanently feeds three amazing waterfalls along the trail. The trail will bring you past each of those three waterfalls at different portions of your ascent. The trail is laden with permanently-fixed ropes, which are required for the steeper parts of the climb, especially when traversing up the mountain alongside the last waterfall. Not only are the fauna and waterfalls spectacular, but the site at the top is completely unparalleled on a clear day. Here you'll find a view back toward Honolulu and most of the east side of O’ahu. Right and Up tip: Bring a camera, snacks, sunscreen, and LOTS of water! You’ll want to rinse off and cool down once you’re done with this beast, so bathe in the stream at the base of the stream on your way back to the trailhead. The Pali Lookout is another one of those favorite tourist spots on O’ahu. At the top of the Nu’uanu Valley, it features a spectacular view of the tall Ko’olau Mountains and the windward side of the island. However, there are two hikes that deviate from this lookout point that offer even more amazing views than the ones the tourists typically get to see. One of these trails, which is lightly trafficked and goes up the ridgeline to the right of the lookout, takes you up to the Pali Notches. Gain access to the trail by hopping over a small, chained barrier adjacent to the Pali Lookout. This trail is not maintained, but the steps of hikers who came before you make the path easily identifiable even through dense vegetation. When in doubt of your path, just keep climbing up toward the ridgeline. Beware the 1000-foot drop down the steep cliff on one side of the trail. But, there is plenty of open ground along the trail, making this hike perfectly safe for the more cautious hiker. It’s a beautiful spot for pictures, so be sure to go on a clear day! Right and Up tip: King Kamehameha used the notches as lookout spots and cannon firing positions. Tactically, it provided fantastic cover and concealment while also offering unparalleled views of the windward side of the island. If you are feeling bold, you can use ropes along the trail to descend the steep rock faces that actually descend into these notches. Completing that part of the hike is possible (I’ve done it) but using those ropes significantly increases this hike’s level of danger. Proceed at your own risk! The trail to the top of Diamond Head—a 400,000-year-old crater—offers a view of Honolulu that is absolutely breathtaking. 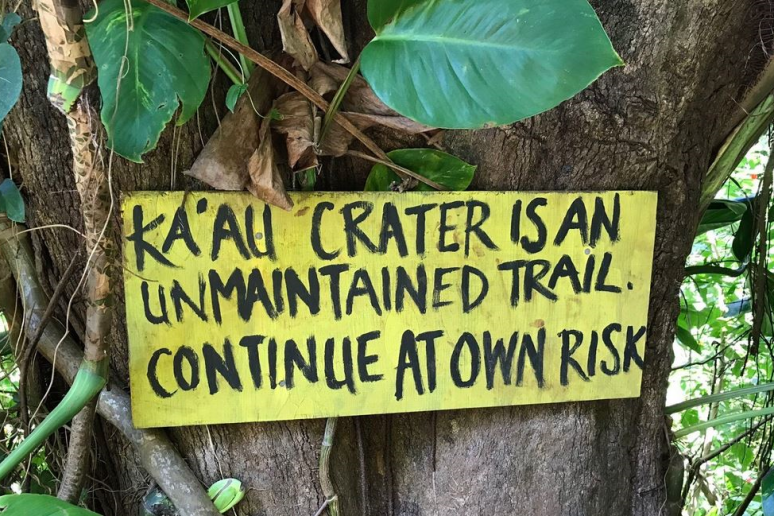 The crater’s proximity to the tourist hotspot of Waikiki makes it one of the most popular hikes on O’ahu. The entire trail is paved or carved out for pedestrians of all ages and skill levels. The Army Corps of Engineers developed pillboxes at the top of this crater, which made great vantage points instrumental in establishing the island’s defense. The trail to these pillboxes takes you through a manmade tunnel and up a long set of stairs to the edge of the crater. Adventurers can still venture along the same tunnel and stairs to occupy those abandoned pillboxes and look out over the entire South Shore of O’ahu. 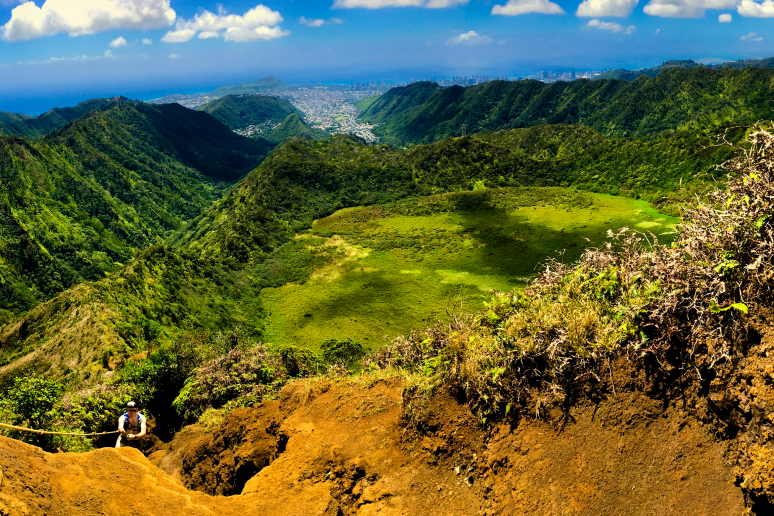 This hike isn’t as challenging as some of the previous ones mentioned on this list, but the views of Honolulu and the Pacific Ocean easily qualify it as one of my favorite hikes on the island. Right and Up tip: Parking is limited, so get there early! And don’t forget to bring cash. The state monument charges $5 per car and $1 for pedestrians. Along the Kaiwa Ridge Trail on the east side of the island is a short rocky climb that starts in a residential neighborhood near Lanikai Beach and will take you to the Lanikai pillboxes. 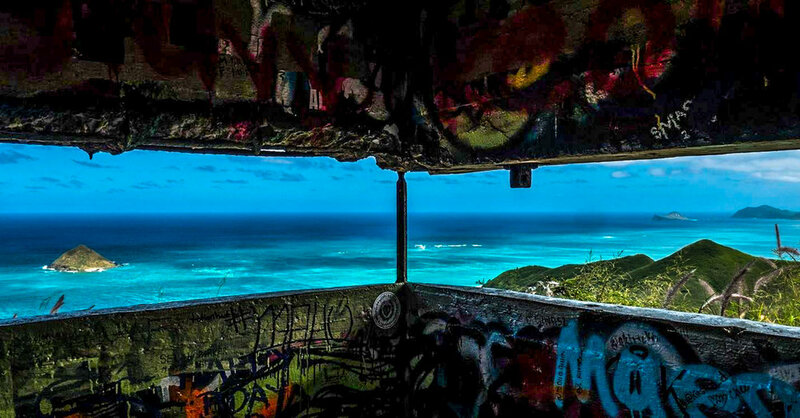 Here you'll find two graffiti-covered WWII-era pillboxes that were used as observation posts and are now hangout spots for both locals and tourists. This trail is open year-round and friendly to both dogs and children. Plus, it boasts some amazing views—not only back toward the windward side of the Ko’olau mountains, but also of the long stretch of Lanikai beach, which is one of the best beaches in the world. Right and Up tip: Competition for the limited parking spaces in the residential neighborhood is fierce. Plan some extra time into your adventure to either wait for a good spot or park farther away and walk. Bring a backpack, a few beers, your favorite music and food to have a picnic on top of one of the concrete pillboxes. Aloha, fellow adventurers! I look forward to seeing you out there! John Haynes is an active duty, US Army Captain currently stationed at Schofield Barracks, HI. Connect with him on Instagram or YouTube to see more of his adventures!